Good news first. 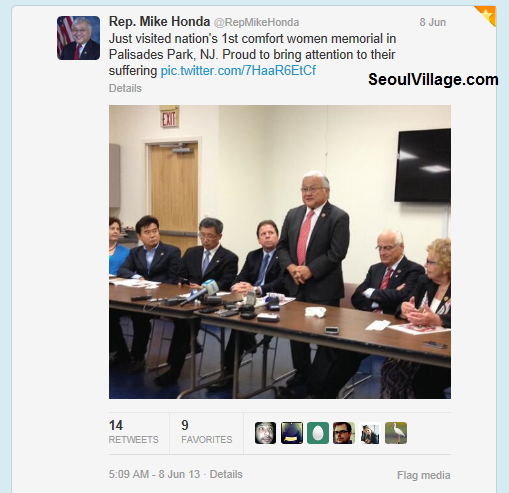 US Representative Mike HONDA sent this tweet yesterday: "Just visited nation's 1st comfort women memorial in Palisades Park, NJ. Proud to bring attention to their suffering", along with a picture where, to his right, we recognize Mayor James RETUNDO and Deputy Mayor Jason KIM (we met last year at ASAN Institute - see "We reject as false the choice between revisionism and nationalism - for a Global Truth and Reconciliation Network"). Mike HONDA has been in office since 2001 in the Californian district hosting the Silicon Valley, but his record reaches far beyond the predictable high tech or immigration issues. HONDA was born in Walnut Grove, CA just a few months before the attack on Pearl Harbor, and grew up in a Japanese American internment camp. 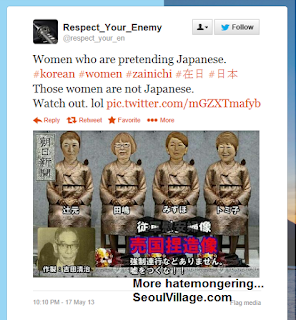 So he knows a thing or two about Japan history, as well as about unfair discrimination. For instance, in the wake of 9/11, he stood up for American Muslims, who were too often conflated with terrorists. And of all members of the House of Representatives, it was this Japanese American who proposed the Resolution 121 demanding formal apologies from Japan for Imperial Japan's sexual slavery system (reminder: the resolution passed in 2007). Good news again, but of the lukewarm kind: the Abenomics imposture seems to be wearing off. Don't get me wrong: I'm not happy that Japan's economic revival is weakening, I love Japan, and I want this country to succeed. I'm just satisfied that people start questioning Shinzo Abe's trick: this dangerous leader was not trying to help Japan, but bribing the Japanese people at their own expenses in order to pass anti-democratic reforms (see "ABE forced to back down a bit. For the moment. Next PR stunt: KIM Jong-un"). Now entering bad news territories. I just read a distressing Hankyoreh reportage about "Inside Japan’s growing xenophobic right-wing", where Zaitokukai, a hate group, invited media to feed the buzz. 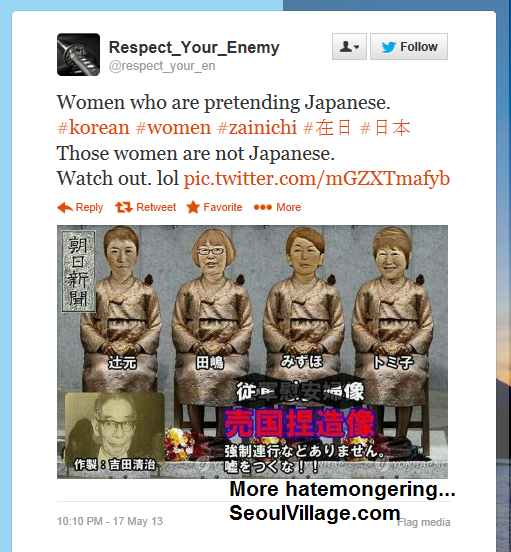 Stopping very very very short of calls for murders, these guys don't hide their hatred of Koreans and Korean Japaneses / Zainichi; they don't hesitate to parade in Tokyo's Koreatown, just like Toru Hashimoto, the Mayor of Osaka, the city that hosts the biggest Korean community, doesn't hesitate to issue the most outrageous provocations about the victims of Imperial Japan's sexual slavery programs (see "So you want to know what is 'necessary', Mr Hashimoto?"). If Japan doesn't have the exclusivity for extremist minorities, it's high time that authorities did something to outlaw openly racist organizations and individuals. Of course, with "authorities" such as Shinzo Abe, calling for a minimum of decency is just wishful thinking.